Islanders on Barra have been left furious after the second breakdown in five days of their “lifeline” ferry service to the mainland. Isles MSP Angus Brendan MacNeil has described the response from ferry operator CalMac to repair the ferry Isle of Lewis, leaving islanders without a service for the second time in less than a week, as “pedestrian”. Engineers who were due to arrive on the island yesterday have been stranded on the mainland because weather conditions have seen a number of routes to and from the Western Isles and inter island cancelled. The engineers also need to source steel to complete the repair. Last week, the MV Isle of Mull came to a standstill due to a fisherman’s creel caught up in its propeller. The Isle of Lewis is unable to move from its position in Castlebay. Any replacement boat on the route will, in the meantime, not be able to use the dock on the Isle of Barra. It is understood it was a third of its way into a journey to Oban, when it returned to the isle. Mr MacNeil is furious about the situation, he said: “Not only are businesses suffering because nothing is getting on or off of the island – the real issue here is that CalMac are taking a very pedestrian attitude to what is a crisis for islander. “I asked them yesterday morning to get a helicopter to bring engineers to the island. “Manyana is the equivalent of an emergency response for CalMac, and we are looking at being without a ferry for at least 48 hours – and there is no sign of anything happening with any speed. A statement from community group Guth Bharraidh said: “The MV Isle of Lewis is still currently off service having returned to Castlebay with an issue with her bow thrusters. 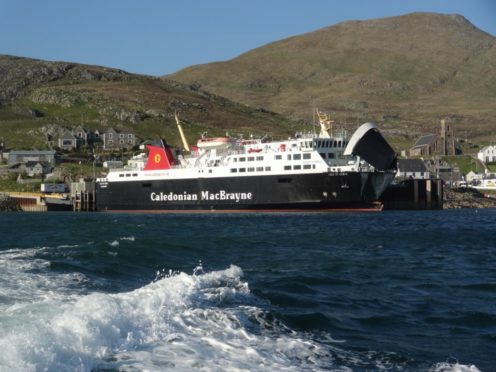 “CalMac are speaking to local private operators to see if they can get the Stornoway Engineering firm across safely to commence work so the MV Isle of Lewis can be taken off the berth to allow access for any other vessels. CalMac said it had looked into hiring a helicopter to get engineers to the island, but the weather had hampered efforts. A CalMac spokesman added: “We are working extremely hard to try and get the personnel and resources we need to address the technical issue on the MV Isle of Lewis as quickly as possible.